Araewenel Elvanui, Dreamer: Cosmetic Weapons! Whargarbl! Linhael has been thoroughly enjoying questing around Mirkwood lately, picking up lots of quests that his sister left undone, so he could come and get them later. A couple of days ago he picked up a quest with a super shiny, pretty sword for a reward. Absolutely perfect timing with the Cosmetic Weapons system coming in the same day! While Linhael is a Rune-Keeper and has very limited (or no? 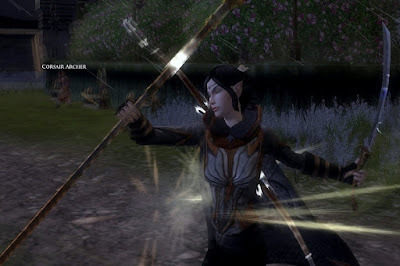 Haven't checked yet) cosmetic weapon options, Araewenel has been longing to get her hands on a sword like this. Here she is sporting it with glee in Dol Amroth.